Our topic today was all the natural disasters that Earth is prone to : earthquakes, tsunamis, tornadoes, landslides, volcanoes — all the stuff that disaster movies thrive on, only we were more interested in the reality and the geology that’s behind all those disastrous events, not to mention how to communicate that reality to the public. 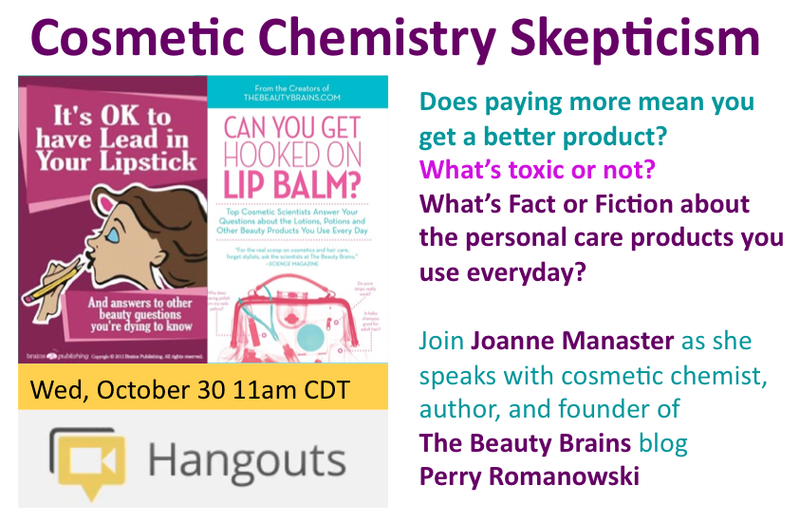 I recently had a Google Hangout on Air with the author of the books from The Beauty Brains called It’s OK to have Lead in Your Lipstick and Can You Get Hooked on Lip Balm? : Top Cosmetic Scientists Answer Your Questions about the Lotions, Potions and Other Beauty Products You Use Every Day , Perry Romanowski. It was a very informative and enjoyable chat! In this episode we talked about everything that makes our world so wonderful with the guy who wrote the book about (nearly) everything: Marcus Chown, author of “What a Wonderful World : One Man’s Attempt to Explain the Big Stuff”. And, indeed, there’s some big stuff in this book — and our conversation. Cosmology, cell biology, mathematics, evolution, physics, just to name a few. As always, we had a lively, fun, and informative conversation. Our especially brave guest for our lucky-thirteenth show was David Epstein, author of “The Sports Gene : Inside the Science of Extraordinary Athletic Performance.” As always we had a wide-ranging conversation that included not only engaging topics, amusing anecdotes, and fascinating facts from his book, but a discussion about how to communicate necessary and interesting stories — about science or most anything else worthy of the time — that take some time to tell. We had something for sports enthusiasts and science enthusiasts, and for those who happen to be both, all in one great conversation. We talked with Temple Grandin and Richard Panek, authors of “The Autistic Brain : Thinking Across the Spectrum” about autism and sensory disorders and neurological brain-imaging tools and thinking in pictures and thinking in patterns, and lots of other stuff too. As Richard put it, we covered a lot of ground, and our guests were generous with amusing anecdotes and amazing insights. Myrmecologist, entomologist, naturalist, writer, and thinker about the human condition, Edward O. Wilson was our guest to talk about his recent book, “Letters to a Young Scientist”, what it takes–and doesn’t take–to have a successful life in science, and how we can encourage (and must encourage) more people to be involved with science, and more young people to take a path that leads to a career in science. Human genomics since the time of the Human Genome Project and the first sequencing of the human genome was our twenty-first century topic, and we covered a lot of ground with three well-informed and interesting interlocutors: Misha Angrist, author of “Here is a Human Being”, Kevin Davies, author of “The $1,000 Dollar Genome”, and Matthew Herper, science & medicine writer at Forbes Magazine. This article originally appeared at my Scientific American blog. 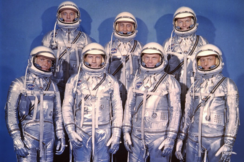 Today, the 44th anniversary of the first moon landing with Neil Armstrong’s and Buzz Aldrin’s first steps on the moon, I present to you some great books to read about space travel, each with their own video, whether it is a trailer for a movie made based on the book or a proper book trailer, a more recent phenomenon.